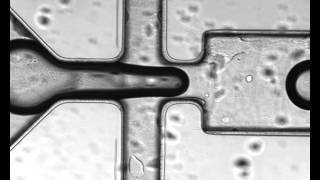 Our research in microfluidics aims at developing lab-on-a-chips, i.e. performing chemical or biological processing at small-scale. Our activity is organised around the miniaturization of physico-chemical unit operations, such as liquid/liquid separation by membrane pervaporation [1,6], continuous flow crystallisation [2,12,13] and bubble dissolution in bubbly flow regime [3,4,10]. Integrating one or several of these unit operations should lead to innovative and competing lab-on-a-chip devices for the fields of fine chemistry, pharmaceuticals and biotechnology. 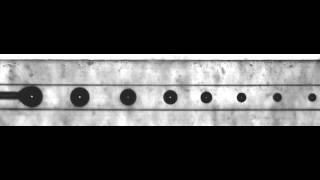 Bubbles and droplets are elementary components in microfluidics and deserve a special attention as they are widely used in two-phase microfluidic applications. Therefore, modelling and predicting their dynamics in microchannels is of utmost importance. We thus investigate on the one hand the dynamics of confined (Taylor) bubbles, and especially the influence of buoyancy  and dewetting  on the lubrication film, developing in parallel an original method to measure its thickness . On the other hand, we study the dynamics of unconfined bubbles in microchannels, paying a special attention to the inertial and capillary migration forces , as well as to the role of surfactants . 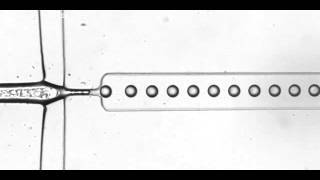 Note we have in parallel developed an droplet generator, referred to as the “Dropbox technology” and allowing to produce monodisperse droplets in dripping mode at high throughput . This generator does not require surface treatment so any type of emulsification can be obtained with this device, such as oil in water, water in oil, bubbles or even partially miscible emulsions.